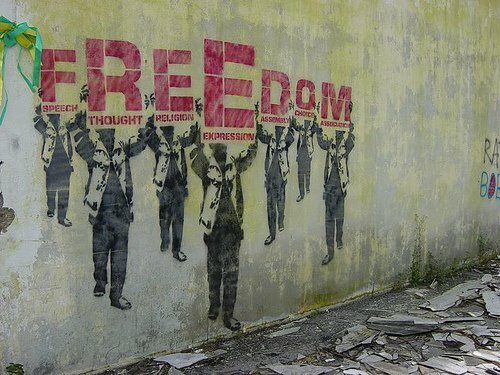 Freedom – Can it really exist? I was watching “Soldiers of Change” at home and it was really interesting. Th story shares a lot of things of every man or race’s desire. It was a story about life, passion and true worth. It was a fascinating story about freedom. It made me think of our own freedom and how many lives have been sacrificed for such “freedom”. Even today, our own community still cries for the changes that we have cried out for so long. Try to see the news of people in the streets, documentaries of leftists and rightists fighting for that one cause we surely desire for so long. I don’t want to blog about the meaning of freedom, a lot has been made and remade to capture the exact definition of it. All I want to air out is that freedom, although many have staked their life for it, is not what we sometimes expect it to be. After watching the movie, I came to a realization that sometimes freedom is the absence of life for another. Freedom gets the life of the other, for another to be truly free. A person’s perception about freedom varies from good to bad, rich to poor or vice-versa. Freedom, for centuries has been tagged with getting away from oppressors and yet, unfortunately, to an oppressor, freedom is taking away the will of others to experience it. But to someone who has been in darkness for so long, FREEDOM is something as a gift that cannot be given without someone loosing his freedom,and sometimes the freedom to live. Watch any movies about freedom and you’ll see the dreaded reality that freedom has and will always be with a price. And that price is not one’s own income or estate, but of someone’s life. When we were oppressed during the Martial Law, many media and political figures stood for such freedom. But look at where we are now, still there is (and will always be) people power in the streets, still there is corruption,there is poverty, hatred and much more. The freedom that we long for seems to be the slavery of another, not by mere men but with the situation they are into. Imagine the downfall of the Marcos’ regime but one person’s life laid down (or killed for it). In our human aspect, freedom is what we want to experience the life without boundaries. It’s the life we always dreamed of, a desire for more or even pay for. But to many of us, freedom can also be the opportunity to get more from others and sometimes the life of others. And to some, it’s that freedom that cause them their greatest fear- loosing the life they always wanted to live out. I am not arguing of taking away freedom, but just the reality that freedom has a price tag – and it is definitely not money but life of another.Can someone’s life be freed for another man’s death? Life maybe unfair, but I believe freedom is much bitterly unfair.